“I want homemade bread and I want it now!” If that’s what your inside voice is saying, and if you have 30 minutes, then my flatbread recipe is for you. It takes only thirty minutes, start-to-finish to make delicious, fragrant, yeasty, fluffy flatbreads. I have never seen a faster recipe for flatbread than mine. Everybody wants to knead and rise, knead and rise, but I say, “Why?” Mine looks and tastes amazing so why waste time? I could live on egg salad! And that’s easy because it takes me five minutes to make my low fat, easy egg salad. I prefer it simple with just yellow mustard and light mayo but I know a lot of people like to add extras like pickle relish, onion, celery, olives, etc. So go ahead. Use my simple, healthy recipe as a starter and then make it your own. But for me, plain old egg salad on some whole grain bread with lots of lettuce and tomato – it’s the perfect breakfast, and a perfect lunch. 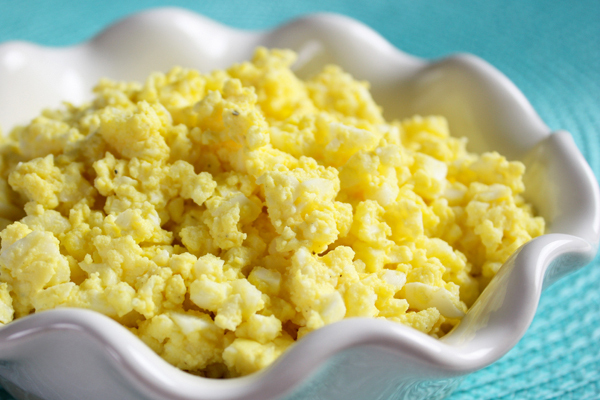 Now that eggs are back, you can enjoy this easy and healthy egg salad. But even my delicious egg salad is no fun if it takes ten minutes to peel a boiled egg. So to make things even easier, I can show you how to make perfect, easy-to-peel hard boiled eggs. For the video on how to boil eggs, click here. For my blog post with even more info on boiling eggs, click here. For the latest research on eggs, click here. And for my Simple Egg Salad Recipe click here. Anyone can make perfect hard boiled eggs that are easy to peel with no green ring. My method is easy and it’s foolproof. There is always a bowl of hard boiled eggs in my fridge, always available for snacking or if I’m in the mood for egg salad. If company’s coming, I can make some quick deviled eggs and everybody LOVES my deviled eggs. Did I mention egg salad? I love egg salad! Who knew croutons were so easy to make? 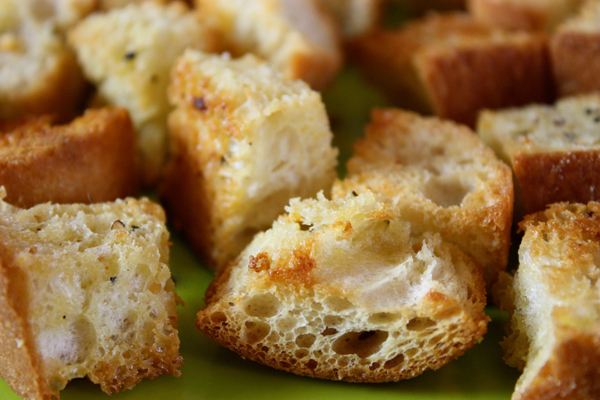 Once you try homemade croutons made with fresh ciabatta bread you will be spoiled forever. You could use a different kind of bread but… why? Okay, maybe sourdough, or maybe a loaf of French bread but make sure it’s fresh. They say to use day old bread but I respectfully disagree. Fresh bread will make fresh croutons. The big surprise is how incredibly easy it is to make them at home. Five minutes prep, twenty minutes in the oven, and you have big chunks of toasty, crunchy croutons for your salad, or soup, or (your choice here). It’s not just me calling this the best meatloaf you’ve ever had, it’s everyone who got my cookbook. I published it back in 2006 and to my surprise it was the meatloaf recipe everyone raved about. I knew it was good but never expected that many compliments. I was trying to make it healthier by adding some finely diced vegetables but it turns out that they dramatically improved the flavor and moisture in my meatloaf. You can imagine how much I cook at home but when I make this meatloaf, there’s a certain level of excitement… not just for the delicious dinner but then the meat loaf sandwiches the next day. I made the video to show how easy it is to make one of the classic American meals and how to make it the healthiest it can be. You’ll see why you should not use a loaf pan to make meatloaf but bake it on a foil-lined pan. The added bonus is that there is no cleanup. 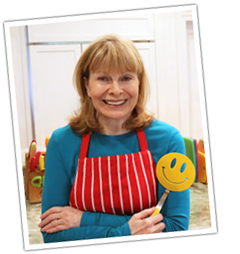 By the way, I’m in the process of adding all of the recipes from my cookbook to this website so they will all be free. p.s. Does anybody know if “meatloaf” is one word or two? Meatloaf or Meat Loaf? My stepmother was Greek and she showed me how her mother made Greek avgolemono, which is a very popular Greek lemon chicken soup. How do I describe this amazing soup? It’s like the pudding of all soups, thick, creamy, and foamy. The thickness comes from adding egg to the chicken stock and the foaminess is created by beating the egg with an electric hand mixer until it’s thick. 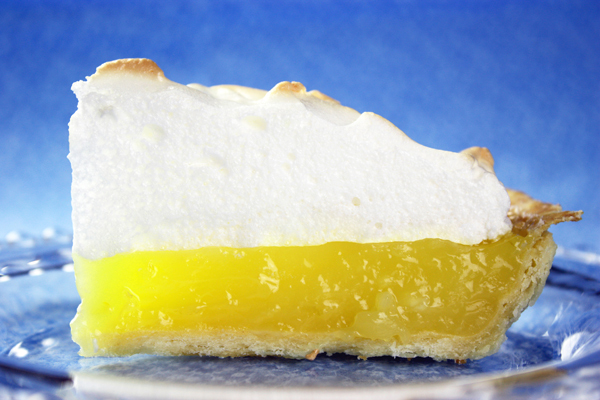 And that fabulous lemon flavor comes from fresh lemon juice. My stepmom, Roula, showed me how she sets up the beater and mixing bowl right next to the chicken stock heating on the stove. This way, once the egg is nice and thick, you can easily and slowly ladle the hot soup into the egg before you add the egg to the soup. You do it this way to “temper” the egg and warm it up so it blends into the hot liquid. If you just poured the beaten egg into the hot soup, you would have scrambled eggs floating in the pot. 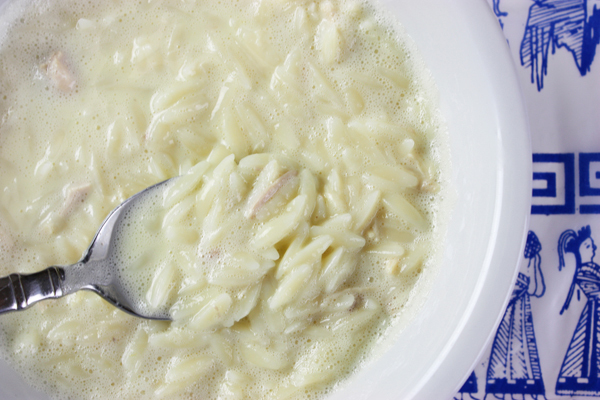 Traditionally, avgolemono is served with orzo or rice. Pieces of chicken are always a good addition if you have it and of course, homemade chicken stock will make this soup taste out of this world. I make my own stock and this way I have pieces of chicken to add to the soup.